Are you stylin’? International trend guru Tom Julian is. But, guys, how do you know you’ve (or, ladies, your man’s) got the right clothes? Julian’s new tome helps make the choices simple, breaking it down by style category and showing what clothes to wear and — here’s the important part — how to wear them. 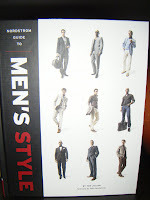 Julian’s debut Style guide is garnering stellar attention, what with GQ Magazine’s recent swanky NYC book launch, Women’s Wear Daily’s reporting Nordstrom getting in on the book business and a style question-and-answer evening at the Princeton Club. Julian also ended up in The Dish Rag by Elizabeth Snead (latimes.com), dishing on how ladies can dress their men like George Clooney, Brad Pitt or any one of their favorite celebrity stud they’d like to see themselves dating.